Shutters are one of the most versatile window furnishings available. Aesthetically beautiful and equally practical they are one of our most popular products. 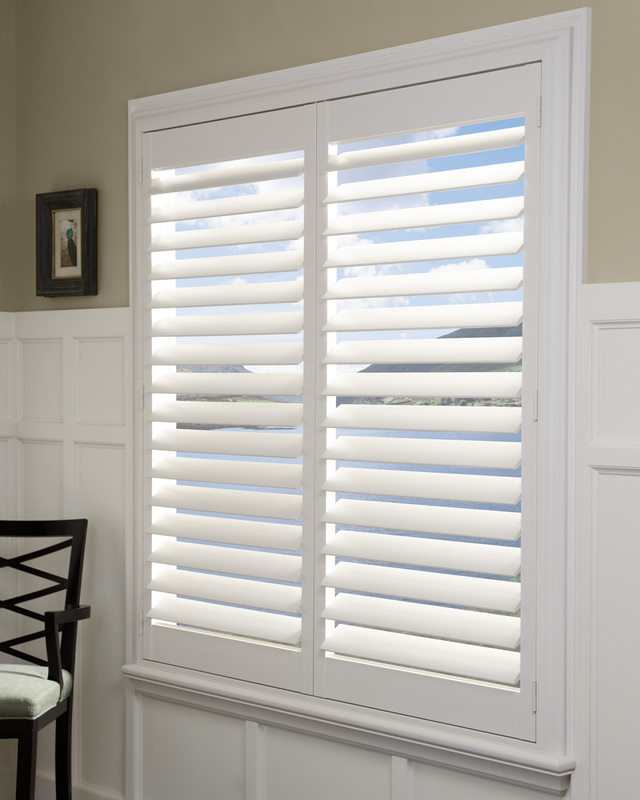 Our Shutters allow complete control of light and airflow without disrupting your view. We offer an extensive range of materials and colours to match your property. Look­ing for a shut­ter that balances beautiful designer finish with exceptional dura­bility? With our top of the range Aluminium shut­ters you will achieve the per­fect result every time. Man­u­fac­tured solely from premium alu­minium they have opti­mal levels of dura­bil­ity and UV resis­tance – with­out any com­pro­mise on style or sophis­ti­ca­tion within your room. We can easily powder-coat these Shutters to match any room Manufactured to Aus­tralian stan­dards, we've found after a decade of instal­la­tions that usabil­ity, dura­bil­ity and pre­sen­ta­tion remain consistent. Your selec­tion ranges from a choice of mod­ern colours whilst extending to the size of the blade and the design of open­ing; whether fixed, hinged, slid­ing or bi-fold. Bass­wood Shutters offer a great value alternative to Aluminium shutters and can be stained, varnished or painted. The timber is dimensionally stable ensuring a prolonged life. Bass­wood is a fast grow­ing hard­wood timber. Native to most of Europe, north­ern Asia and North Amer­ica providing a lovely white, fine grained tim­ber. Widely used in the con­struc­tion of inter­nal shut­ters due to its fab­u­lous work­a­bil­ity within the man­u­fac­tur­ing process, warp­ing resis­tance and renowned dura­bil­ity. All the attrib­utes of Cedar at a reduced cost. Our tim­ber shut­ters come in a range of appear­ances whether stained, var­nished or painted – ensur­ing you will find the per­fect fit for your rooms styling. Cedar Shutters provide an exceptionally attrac­tive and dimen­sion­ally sta­ble option. When treated with nat­ural oil the beau­ti­ful grains and colours stand out to make the most inspir­ing plan­ta­tion shutters. Our tim­ber shut­ters come in a range of appear­ances whether stained, var­nished or painted. Ensur­ing you will find the per­fect fit for your rooms styling. Thermo Shutters offer an enhanced, water-resistant alternative to traditional Shutter materials. Our high quality, custom-built Thermo Shutters are suitable for areas prone to water contact and exposure to external elements. The appearance is almost identical to Basswood with a large selection of colours to match your home. We can also offer Thermo shutters in combination with basswood to align with the individual requirements of your property.